Phil Housley was less than thrilled with the result of last night’s clash with Nashville. Based on the Predators’ average level of performance this season, I’m typically inclined to agree with such statements from their opponents. In this particular case, though, I’m not so sure. To be fair, Nashville’s former assistant coach was referring more to his team’s second goal being disallowed, due to a delayed penalty and an early whistle. With that, I’m certain, most of you can sympathize. Still, on the whole, I’d say he’s incorrect in claiming Buffalo’s to be a winning performance. In terms of five-on-five possession and scoring chance generation, the game provided an all-too-rare glimpse at how dominant this Nashville team can be. Let’s take a look at specifics. How did Nashville produce from top to bottom? All of the values below are from five-on-five (no special teams included). There are two primary (if somewhat boring) takeaways regarding the offensive lines last night. First, offensive zone sheltering was a major factor. Second, Jack Eichel plays an ungodly number of minutes. Like, more than 26 minutes of all-strengths TOI last night. As a forward. Johansen’s line received a friendly zone deployment and ran with it. All these guys do is produce offense. Filip Forsberg generated eight shot attempts alone, though none was a high-danger scoring chance (shame on you, FIlip). Ryan Johansen, at the other end of the quality/quantity spectrum, produced a single shot on goal. Guess where that ended up. Aside from a potentially elite first line, another glimmer of hope for this Nashville team is the (hopeful) cementing of Mikael Granlund, Kyle Turris, and Craig Smith as the established second line. No more of the Bonino/Sissons experiments, please. Many of those watching the game claimed it to be Turris’ best performance of the season, and Granlund’s best as a Predator. It’s no coincidence. The passing and shot generation from this trio is symphonic. While the second line avoided taking a single defensive zone faceoff at five-on-five, the third line of Austin Watson, Colton Sissons, and Nick Bonino was in the opposite boat. Zero offensive zone faceoffs. Pair that with a hefty chunk of time against Jack Eichel & Company, and you have a challenging night. Although they were beaten in high-danger attempts, this line did contribute to a nice advantage in shot attempts. Finally, the fourth line. There isn’t too much to say about their night. They did slightly worse than the third line with a slightly easier assignment. All in all, not too shabby. P.K. Subban’s extraordinary ability shone at both ends of the ice. To suggest that this is somehow an isolated performance is ridiculous. In terms of the elements I find important – controlling possession, transitioning between zones, forcing low-quality shots from opponents, etc. – Subban is as consistent as it gets. To put it kindly: the vehemently anti-P.K. people are failing to see the whole picture, or even the majority of it. In no way do I mean to disparage Mattias Ekholm. The pair continued as usual with their dominant performance last night. Roman Josi and Ryan Ellis were somewhat less dominant, due unfortunately to a weak showing from the latter. More than Subban and Ekholm, Josi and Ellis rely on their offensive ability to overcome some relative weaknesses in the defensive zone. When that offensive production is absent, it hurts. Wrapping up the defensemen was the third pairing of Dante Fabbro and Dan Hamhuis. Credit where it’s due – playing Fabbro again was the right call from Peter Laviolette. His first NHL game left much to be desired. An opportunity to bounce back against a thoroughly eliminated Buffalo team was just what the doctor ordered. 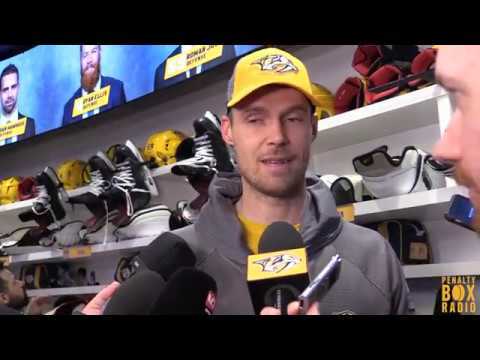 Pekka Rinne provided something of a good news/bad news situation last night. The bad news is, he wasn’t excellent. The good news? The Nashville Predators actually won a game without Vezina-level goaltending. Shout it from the rooftops. Make no mistake, Rinne’s performance wasn’t bad. Typically, though, a “not bad” goaltending show means a Nashville loss, with very few exceptions. All you can really ask from Rinne is to make one more high-danger save than he did. Otherwise, he did his job just fine. Yes, it’s the Sabres. But man is it good to see Nashville dominate a game. Colorado and/or Arizona can do Nashville a huge favor in the next few days by taking points from Winnipeg. Chicago and Philadelphia can potentially do the same with St. Louis (thanks for the reminder, Ken). I’d highly recommend watching those games, if you’re able.